WorkSpectrum encompasses the spectrum of work in which Organizations perform, track, communicate and report on their work activities. 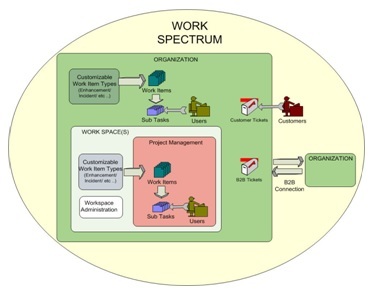 WorkSpectrum offers an integrated approach towards organizing work and communicating with respect to work items and integrating work items with project management. WorkSpectrum extends the reach of Organizations to communicate with other external Organizations (such as Data Centers) using web Services. 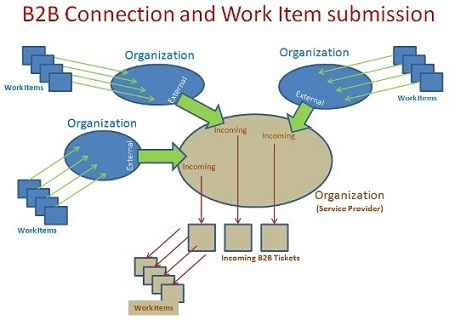 Organizations can establish B2B type connections, and once connected WorkSpectrum seamlessly integrates submitting and tracking Work Items with the external Organizations. WorkSpectrum establishes Communication Portals at the Organization level and workspace levels for facilitating communication amongst the Organizational users. Thus providing unique framework for communication.